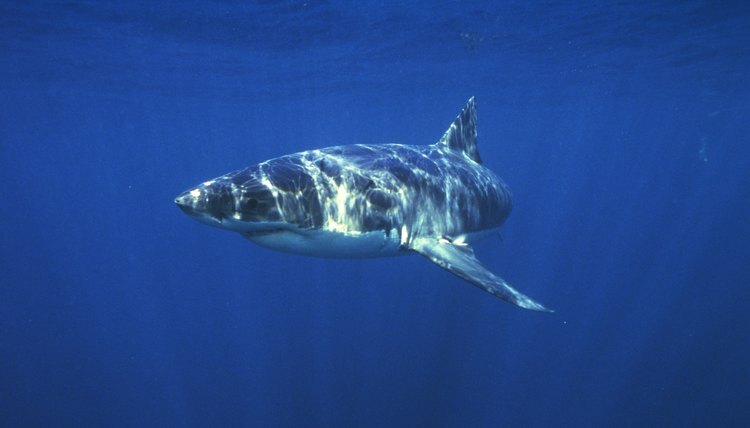 The great white shark, made infamous by the movie "Jaws," is one of the ocean's top predators. The great white is the largest predatory fish on the planet, and has been evolving millions of years into the ultimate killing machine. The animal has a number of adaptations to its physiology and behavior that make it a deadly predator. The body shape of the great white is one of its main adaptations, being much like a torpedo so as to limit friction while swimming. The powerful tail and muscular body help the large fish to swim at up to 15 mph. Sheer size is an adaptation in itself. The shark reaches lengths of up to 20 feet and weighs as much as 5,000 lbs. Because of this, the animal has few predators. The shark's dark gray coloration makes it hard for potential prey to spot it in the dark, deep waters. Sensory adaptations are what make these sharks so successful while hunting. Small sensory organs in the snout called ampullae, or Lorenzini, detect minuscule electric charges given off by all living things. These organs help the great white pinpoint a potential prey item. An amazing sense of smell also helps the shark track prey. The shark can detect a tiny amount of blood in the water from more than 3 miles away. Being so large, the great white has adapted to giving birth to live young, avoiding the need to care for eggs. Between 2 to 17 live shark pups are born, already measuring 3 feet in length. The large size of the newborns also means that the parent does not have to care for them past birth. Most of the shark's adaptations are geared around feeding. The shark will generally use a powerful death blow to kill its prey. It positions itself below a sea lion or seal and swims upward at full speed. It hits its target, mouth wide open, and bites down, often launching itself and the prey out of the water. The shark's teeth and jaws are its ultimate feeding adaptation. The razor-sharp teeth of the lower jaw hold onto the prey's carcass as the teeth of the upper jaw are used in a saw like motion to rip off chunks of flesh. The brutal use of these teeth means they are often broken or lost, so the shark has adapted to grow teeth back constantly.